Greetings from Peru, where I’ve been steadily eating my way around various parts of the country (not an exaggeration). One of the things I love most about travel is the food! Food is such a connector, and I strongly believe in learning more about a culture through its cuisine. As the quote above says, it’s part of people’s identity, and I enjoy being able to have those culinary experiences when I travel. Which brings me to cooking classes. One of the activities I’ve done several times in my travels is to take a cooking class. This started about 4-5 years ago, and in particular, it’s something I’ve done several times with my mom and a few times on my own. I always enjoy the experience, learn so much along the way and meet lovely and interesting people. My most recent cooking class took place in Cusco, Peru with Peruvian Cooking Classes. I found this company through TripAdvisor, and they did not disappoint. During the class, we visited San Pedro Market where we learned about different types of produce and herbs Peruvians use in their cooking and for medicinal purposes. We also tasted several Peruvian fruits and made the national drink, Pisco Sour. 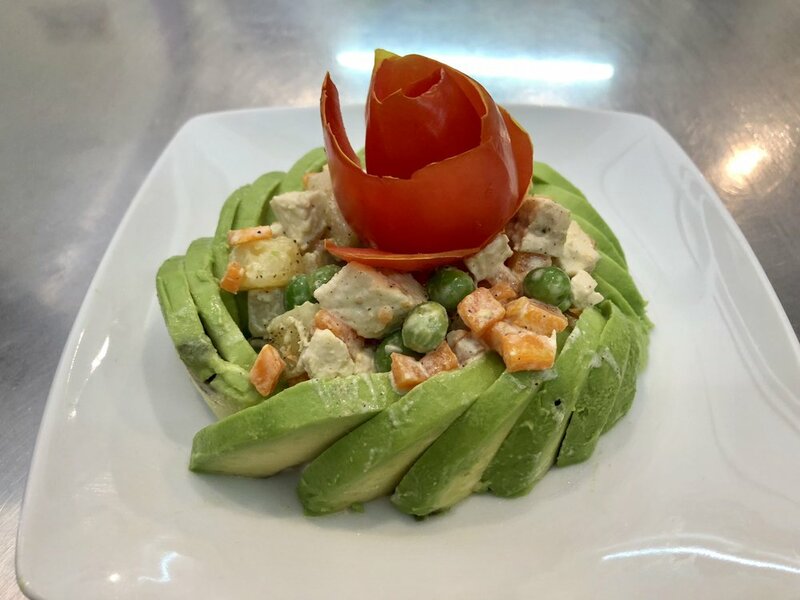 For our three-course lunch, we cooked palta rellena, which is like an avocado-stuffed potato salad with chicken; lomo saltado, which is stir fried beef served with french fries and rice; and chocotejas, which is a dessert made of chocolate, pecans and dulce de leche. Our chef, Julie, was efficient, helpful and a wonderful teacher. Once again, I found Cooking School Yuka Mazda through TripAdvisor and loved my experience. Yuka Mazda is a very colorful character who engages you right from the start. Our group was lively and lovely (and mostly Australian), which made our time gathered in Yuka’s cozy home so much fun. For our lunch, we learned about several key ingredients of the Japanese diet and got a first-hand look at the impressive knives used for Japanese cooking (the knives are works of art in themselves). We then made miso soup, stir fried gyoza and wagyu beef gyudon with sticky rice for lunch, followed by matcha tea and Japanese sweets for dessert. It was a fantastic way to learn more about Japanese culture through their cuisine. Continuing with the theme of colorful characters, during my trip to South Africa in 2014, I took part in a Bo-Kaap walking tour and Cape Malay cooking class with Zainie Misbach. I think anyone who’s taken this class can attest that there’s no one like Zainie Misbach. First of all, she’s full of energy and has a way about her that draws you in immediately even while you wonder whether you can keep up. And then there’s her food, which is seriously fantastic. Following our walking tour of Bo-Kaap, we gathered in Zainie’s home, where we made dhaltjies, which are essentially fritters; roti; minced meat samoosas (with an extra 'o') and chicken curry. I left her class feeling so incredibly full but so incredibly happy. Writing about this class makes me sad, not because I didn’t like it. In fact, I loved this class so much, but, unfortunately, it’s now closed! So sad. I want to write about it anyway because this is where I had (and learned how to make) some of the best fried chicken I’ve ever had! Charleston Cooks was part store, part cooking school where they had a range of classes to choose from. During a mother daughter weekend getaway in Charleston, my mom and I decided to try their Sunday Brunch class. 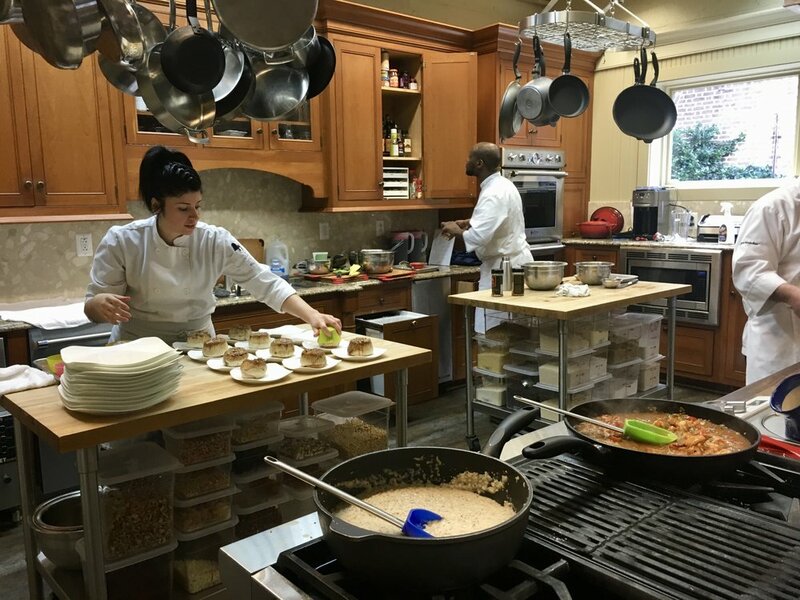 Our group made some fantastic southern dishes, including shrimp and grits, fried chicken and waffles, biscuits with bacon maple jam and more... I mean, why did this place close?! Why??? While living in London, my family surprised me with a cooking class for my birthday - a South Asian cooking class, to be exact. Monisha Bharadwaj is the chef and founder behind Cooking With Monisha and holds a range of cooking classes for both vegetarians and carnivores. I took a class with her that has since evolved into a new name, but at the time it was called the Stylish Indian cooking class. Before we started cooking, we first visited a local South Asian market where we learned about staples of South Asian cuisine. We then walked back to Monisha’s home where she shared more about herself and her career with us, as well as what gives certain dishes its names. Then the cooking began: chicken tandoori wings, paratha, basmati rice and more. The food was so much simpler than I thought it would be, and yet the flavor was incredible. It was an overall great birthday gift! 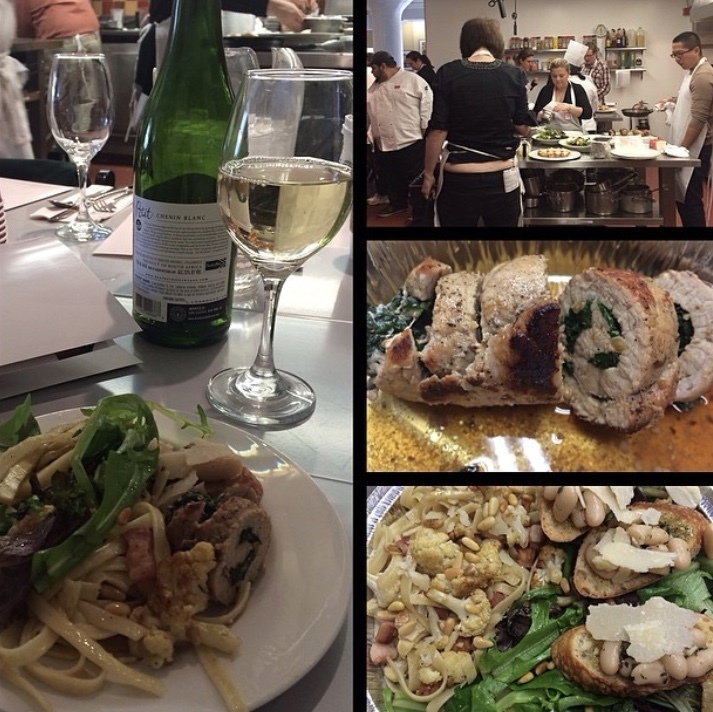 I’ve taken a few cooking classes at the Institute of Culinary Education, but there’s one that still stands out to this day as my absolute favorite, and it's been years since I took this class. 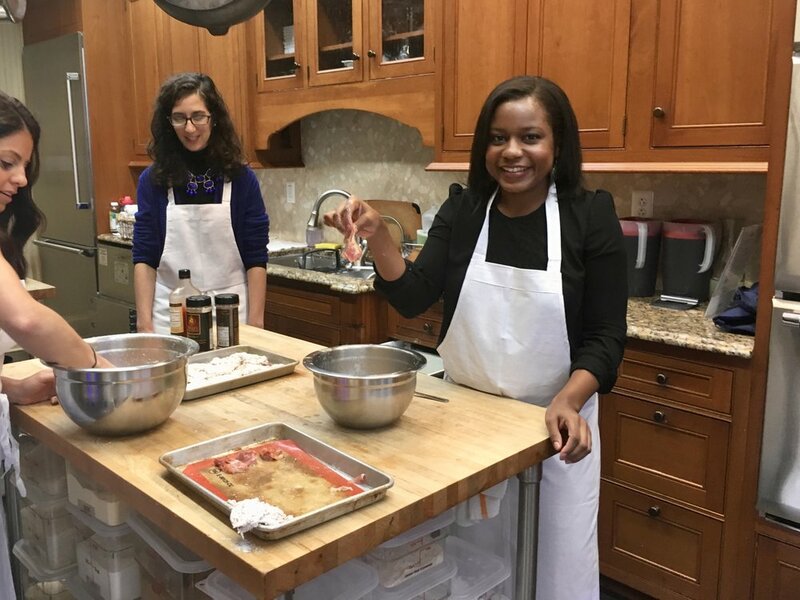 It was a new food and wine pairing course taught by the executive chef of a well-known New York City restaurant, and in the class, we cooked an eight-course meal! Yes, that’s right - eight courses! And it was all beautifully done. Dishes like clove-poached lobster salad with crispy parsnips, veal-stuffed pears with cognac and more. Each course was accompanied by a wine pairing, and I don’t mean a wine tasting, I mean a wine pairing. Needless to say, by the time we got to dessert, we were all fast friends who thought this class was the best thing since sliced bread. I’m not even sure if the class was ever done after that first time. All I know is that I walked away a happy lady with an entire leftover bottle of port wine. Now, I just have to figure out where in the world my next cooking class will be! Any tips? Have you ever taken a cooking class? If so, where?